There are many symptoms of MS that you should be aware of so you can see your doctor right away to be treated if you believe you have MS. Know details here! Known as an autoimmune condition, MS is when something goes awry with the immune system, which is the body’s defense against infections. The body then mistakenly attacks body tissue that is healthy. In this case it is the myelin covering of the nerves. Because of this, multiple sections of the spinal column and brain can become damaged and hardened (sclerosis), which can then disrupt the nerve signals that pass through these areas. What exactly causes the immune system to act in such a manner is not clear, however most experts believe that a combination of environmental and genetic factors are to blame. There are numerous different MS symptoms. A lot of people only experience a few of them and it isn’t likely they will develop all the symptoms listed here. Symptoms of MS are generally unpredictable. Some people experience their symptoms worsening over time gradually. Seen more often, symptoms come and go at various times. Times when they worsen are called relapses, and periods when they improve or go away completely are called remissions. Relapses can happen at any time, and your symptoms can vary with each relapse. Even though relapses generally happen for no reason that is apparent, there are various triggers which include exercise, infections and hot weather. For 1 in 4 people, vision problems are the batch of first symptom of MS. Swelling or inflammation of the optic nerve can happen, which is called neuritis. This causes pain behind your eye and also loss of some vision. It generally affects one eye. Other eye MS symptoms could include double vision or blurring of vision. Spasms or tremors of some muscles can occur. Usually, this is because of damage to the nerves which supply these muscles. Some muscles could shorten or contract tightly and then become stiff and more difficult to use. This is known as spasticity. Musculoskeletal pain – this pain happens in any of the muscles which are affected by spasticity or spasms. Neuropathic pain – this pain happens because of nerve fiber damage. It can create a burning sensation or stabbing pains over parts of your skin. Areas of your skin could become quite sensitive as well. Extreme tiredness or fatigue is one of the most seen MS symptoms. This is more severe than the tiredness you’d expect after exertion or exercise. It can even affect your concentration and balance. There are various treatments for fatigue that are usually a combination of physiotherapy, self-management strategies and exercise. You could find that you cry or laugh more easily, even when there is no reason for it. Many people with MS also have multiple sclerosis symptoms of anxiety or depression at some point. You should see your doctor and talk with them about any symptoms you could have, as treatment for anxiety and depression is many times effective. At some point, around half of MS patients have some cognitive problems. This means slowed thinking, poor focus or fuzzy memory, not able to find the correct word to say, forget things easily. Many times these problems are mild and don’t interrupt your daily life. They affect around five to ten percent of people with MS.
As you rest and cool off, these symptoms will likely dissipate. To confirm MS symptoms, there aren’t any specific tests. The diagnosis will rely upon ruling out other conditions which could produce similar symptoms and signs. Blood tests – this helps rule out inflammatory or infectious disease with similar symptoms to MS.
Spinal tap or lumbar puncture – a small sample of spinal fluid is taken for laboratory analysis. This can show any abnormalities in white blood cells or antibodies which can be associated with MS. A spinal tap could also rule out viral infections and other conditions that have symptoms similar to MS.
MRI – this can reveal areas of lesions on your spinal cord and brain. You could receive an intravenous dye so lesions are highlighted which could indicate your disease is in an active phase. These types of tests record the electrical signals made by the nervous system in response to stimuli. This test could use electrical or visual stimuli, in which you’d watch a moving visual pattern or short electrical impulses are put to the nerves in your arms or legs. Electrodes measure how fast the information goes down the nerve pathways. No medications currently can cure MS, but there are other treatments for MS which can shorten how long relapse or attacks last, ease particular symptoms and slow the progression of the disease by lowering the rate of the attacks. The kinds of medications used will depend on a number of factors, which includes what form of MS someone has. Immunotherapy – these are medications which are taken in subcutaneous form or under the skin, intravenous injection or intramuscular, or orally. They slow how frequent and sever the attacks are, meaning the myelin sheaths are subjected to a lesser amount of damage. Immunotherapy works by modifying the immune system’s activity. It is prescribed for people who have MS that is relapsing-remitting. Corticosteroids – These are taken either as injections or pills. 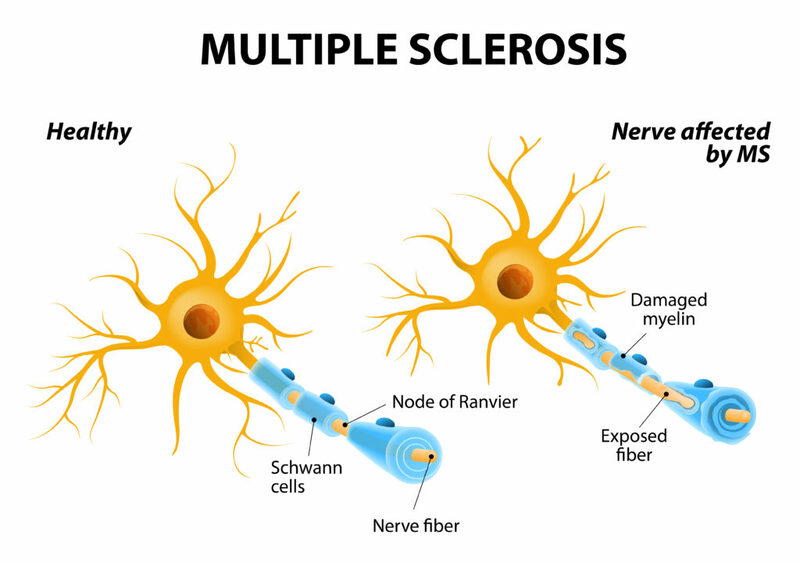 They are used to shorten how long an attack of MS lasts by easing up the inflammation. MS can be a frustrating and challenging condition to live with, however new treatments over the last twenty years have improved the quality of life considerably of people who have the condition. It is not fatal, however some complications which can come from severe MS, like pneumonia, can be. Because of this, the average life expectancy for people with MS is about five to ten years less than the general population. This gap does seem to be getting small, maybe because of the improved medical care available.